With the holiday season almost over it's time to bring some new articles and test new products - and it looks like we do have some very interesting devices to talk about. 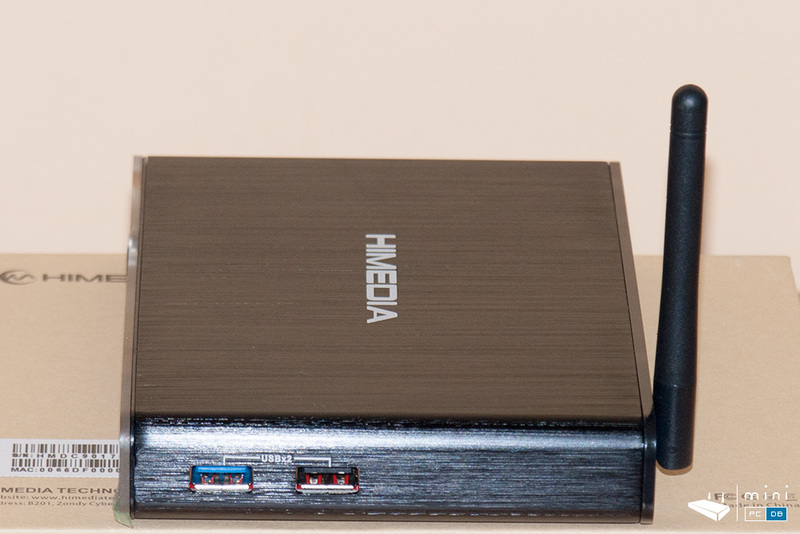 One of them is the new Himedia Q30 TV box, a device that brings a better "bang for your buck" ratio than the Himedia Q10 Pro Mini PC we reviewed a while ago, and that still remains one of the best TV boxes currently available. I've mentioned before that the established manufacturers tend to focus on high-end (and expensive) devices nowadays because the lower end of the market is oversaturated with tons of devices that use cheap SoC's and little to no software/firmware updates. Q30 is designed to hit the sweetspot between them and the high-end devices like the aforementioned Q10 Pro. 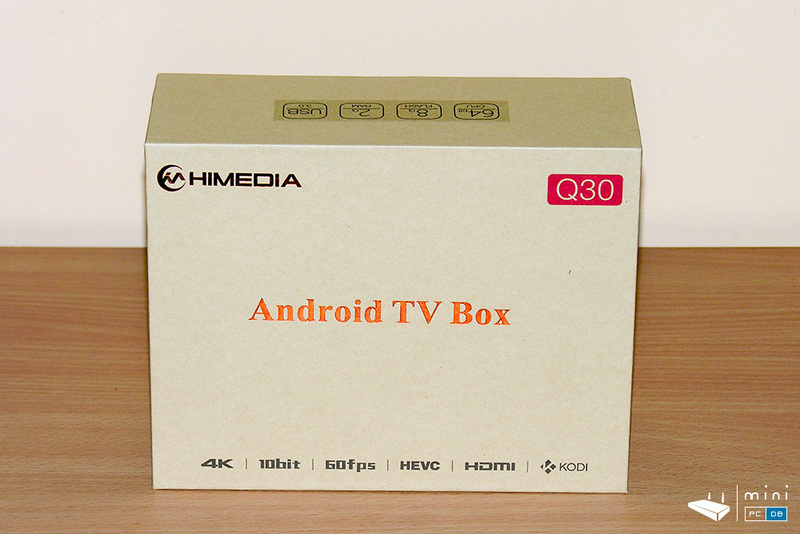 Himedia Q30 can be purchased from GeekBuying . 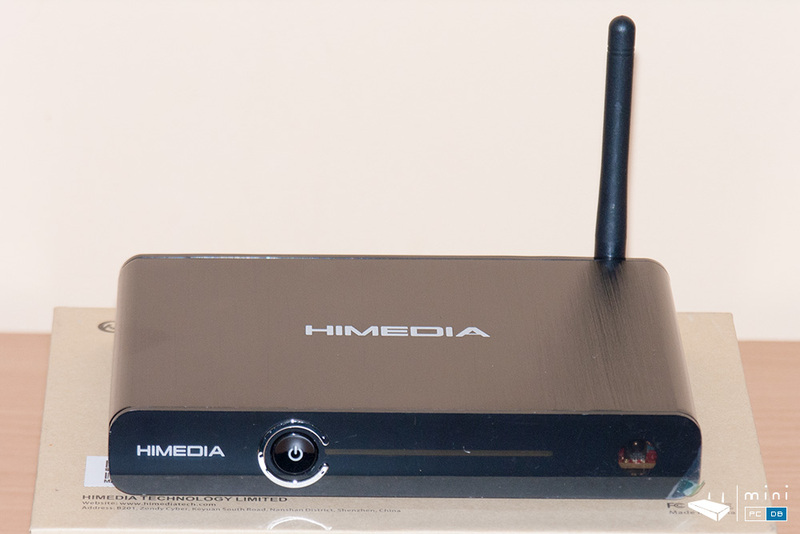 So how exactly did Himedia managed to bring a better priced Mini PC with the same CPU? There are a few small differences, which for most people might not be very important. First of all, the HiSilicon Hi3798M V200 SoC is a cost-down version of the HiSilicon Hi3798C V200 SoC used by the Q10 Pro (notice the "M" vs. "C"). While they share the same CPU, the Mali-450MP GPU is a bit weaker. One notable difference besides the obvious missing I/O ports is that it lacks 7.1 audio and there's no Bluetooth. But you'll still get a device with strong aluminum case and the very good firmware that comes with the Q10 Pro or Q5 Pro devices. Now that we talked about the Q30's specs and it's place on the market, let's go on with the unboxing. 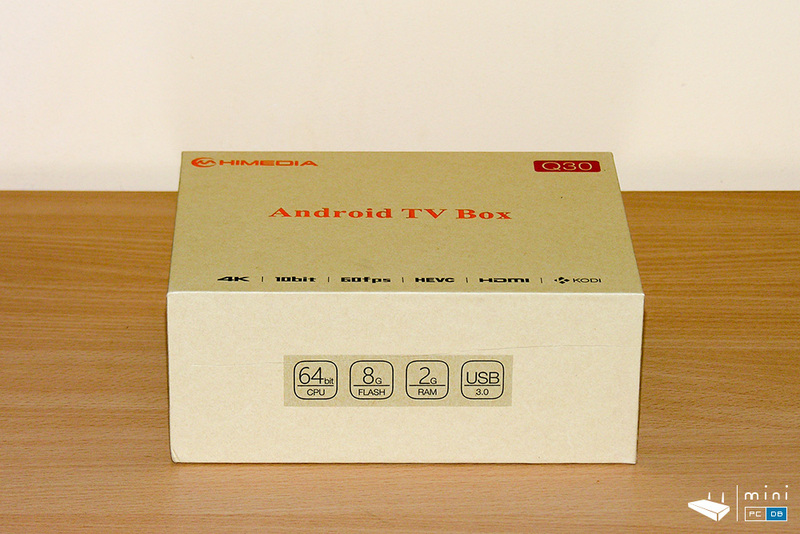 Himedia Q30 comes with a sturdy cardboard box which has the minimum amount of details written on it - brand, name, the omnipresent "Android TV box" subtitle. 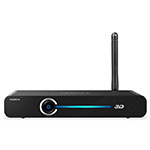 The main features (4K, 10-bit, 60fps, HEVC, HDMI, Kodi) are also on the box top and there's the serial number and Mac address on the bottom. 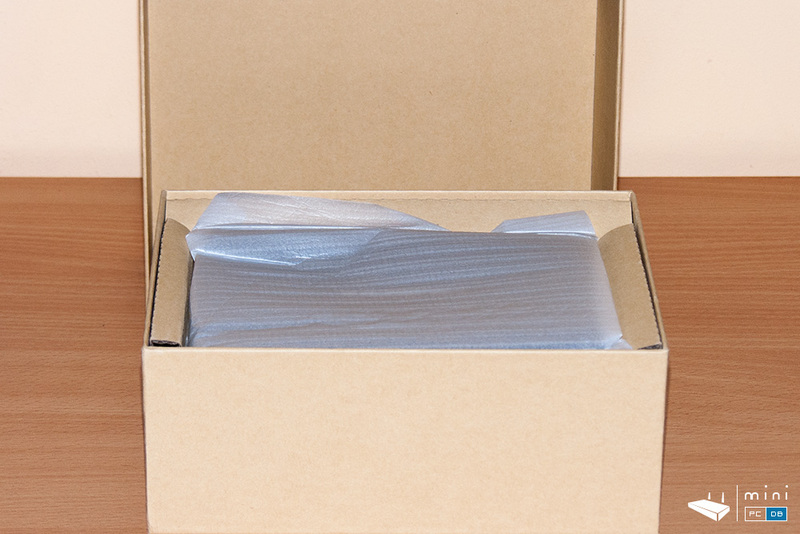 Inside the box there's the nicely tucked Q30 mini PC, which is about the size of a palm. Below the Q30 we can find a quick start guide, the IR remote (with learning) - same as Q10 Pro, power adapter and the HDMI cable. 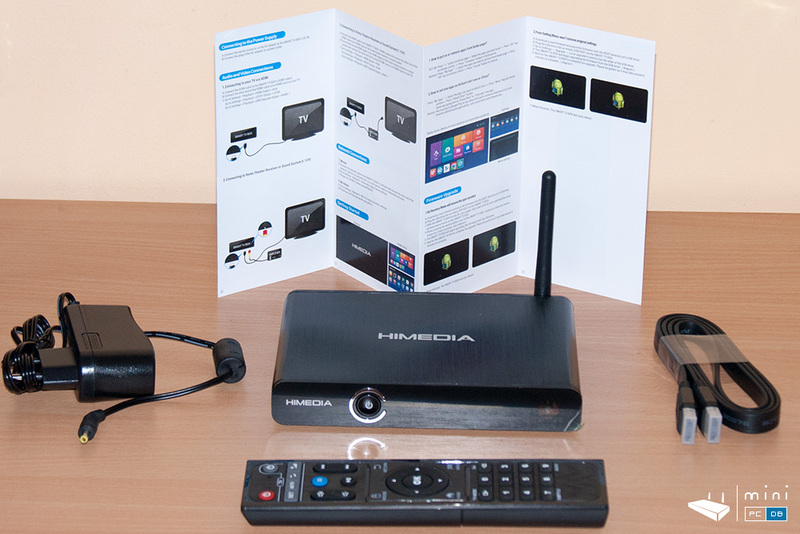 Himedia provides a flat "High speed HDMI cable with Ethernet - 2160P", which was nice surprise. The Quick Guide does a great job of explaining all connections options, how to setup the IR learning function and how to update the firmware for the little device. Back to the Q30 mini PC : the aluminum case looks great - they reused the same casing as the old Himedia Q3 device, beautiful in it's simplicity. The top has just the "Himedia" brand printed, which oddly is also printed on the front, next to the stylish on/off button - that "C" you see is silver aluminum and the button itself is good quality plastic. On the left side, Q30 has one USB 2.0 port and the SD/MMC . The right side has two more USB ports (1 x USB 3.0 and 1 x USB 2.0). As usual, most ports are on the back, with the wi-fi antenna, the composite video, the HDMI port and Ethernet. There's also a reset pinhole. 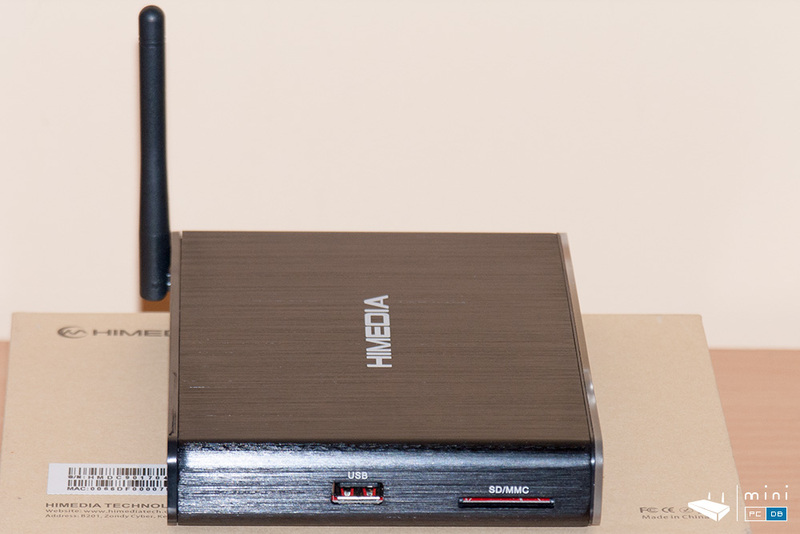 So, as expected, the Himedia Q30 mini PC looks very good, but will it match the Q10 Pro on our tests? We'll see this in the full review, which will follow in a few days. Until then, feel free to follow us on Twitter. If you're interested in the Q30 device, you can find it on GeekBuying, a coupon will be available soon.